The electrification of cars and other vehicles rises the complexity of power trains, electrical engines and control units. This increases the need for highly accurate, synchronized measurement solutions for R&D and test. 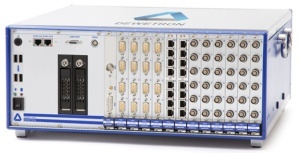 DEWETRON is your competent partner for fully integrated MULTI SIGNAL POWER ANALYZERS for high voltage, battery, automotive and electrical powertrain testbed applications.